Like most students, Jeff Taylor ’87 was a basketball fiend during his Carolina days. Even now, like many fans in the States, he can wax poetic about the NCAA and the NBA, but after spending most of his career in sports journalism in Europe, terms like FIBA, EuroBasket and EuroLeague roll off his tongue as easily as March Madness and Tobacco Road. Taylor has lived in Europe for 23 years — 15 in England and the past eight in Spain — as an international basketball commentator, play-by-play analyst and columnist for the International Basketball Federation (known as FIBA from its French name), the world’s governing body for basketball. Taylor was UNC’s mic man during the 1985 football season; after graduating, he was an assistant high school basketball coach in Indiana, worked summers on Nantucket and traveled around the world before landing at a Charlotte television station and subsequently moving to England. From his European base, he has interviewed many of the biggest names in the sport — and reported from all corners of that continent as well as Israel, China, Lebanon, India, Japan, Thailand, Tunisia and Venezuela. He also covered every summer Olympic Games since Sydney in 2000. As fans in America dive into March Madness, Taylor took time for a fast Q&A from his home in Valencia to share his perspective on an American game that has become a global phenomenon. Where does the level of European pro basketball play — and its commercial appeal — stack up to the NBA and NCAA? The NBA is the highest level on the court, yet top European clubs would compete and occasionally beat them in meaningful games. The vast majority of European leagues are superior to the NCAA on the court. Commercially, it’s not even close. The NBA and NCAA generate much more revenue. One of FIBA’s aims is to boost the game’s commercial viability everywhere with its World Cup Qualifiers system. Since November 2017, leagues around the world have taken breaks and players have left clubs to join their national teams in Europe, Asia, Africa and the Americas to help them qualify for the World Cup, which is in China this year. It’s the same concept as FIFA World Cup qualifiers [in soccer]. 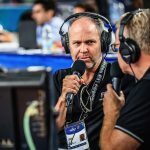 The road to the Olympics goes through the World Cup, so the 32 teams that play at the Basketball World Cup will be the only ones to have a chance to play at the Olympics, increasing the importance of qualifiers. FIBA views the national team as the engine of the sport in most countries. There is more media coverage of the sport when the national team plays. The NBA doesn’t take a break when World Cup qualifiers are played in November and February, but its foreign contingent of stars can join national teams when those games are played in June, July and September. What are some similarities and differences between the U.S. and Europe in the way the game is played, the players, and the fan and corporate culture? The level of play differs from country to country in Europe, as does the intensity of fan support. The atmosphere at games in some European countries like Spain, for example, is wonderful. There are bands in the stands, and it’s similar to what you’d find in the NCAA. NBA players are for the most part elite athletes and will rely more on their individual skills and talent, whereas the game is far more structured in most European countries, with coaches pulling the strings. How have foreign players, especially Europeans, affected the NBA? Clubs now place much more emphasis on scouting around the world and finding players that will be solid and sometimes spectacular players like Greece’s Giannis Antetokounmpo [Milwaukee Bucks] and Slovenia’s Luka Doncic [Dallas Mavericks]. These players take up roster spots that, in the past, would have gone to Americans, usually from NCAA teams. There are more and more players like Antetokounmpo, Kristaps Porzingis [Latvia, Dallas Mavericks] and Nikola Jokic [Serbia, Denver Nuggets] being discovered in Europe, players not even with big clubs. In what ways has European pro basketball become more like the NBA? Have the fans ramped up to it? Pregame and halftime entertainment has clearly been influenced by the NBA. On the court, you see more and more. There is always a lot of music with the latest dance songs during timeouts and pregame. In some arenas, a camera will always focus on different spectators and get them to take part in kiss-cam during timeouts. Sometimes you’ll find cheerleaders, while other clubs do not go with this approach. You often see miniature cannons shooting little marketing gifts, like small basketballs or T-shirts, into the crowd. There are a lot of mascots all over Europe. In France, the lights can be lowered when the players are introduced to the crowd.